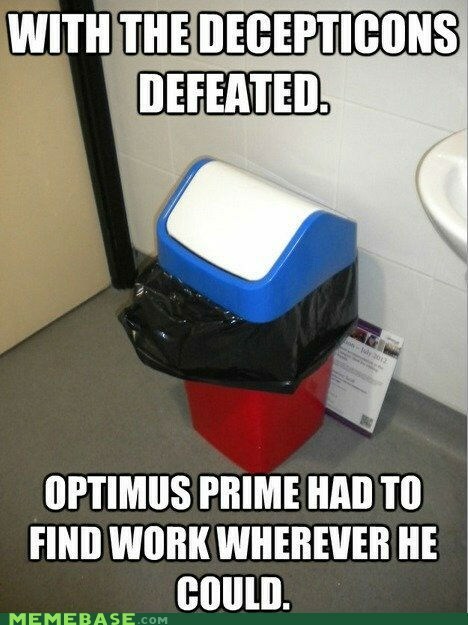 Take your pick, but my favourites include Bumble Bee, Optimus Prime, and the DinoBots. This wicked cartoon, which launched a line of even cooler toys, introduced the world to a fight over energon cubes that still exists today. And they always said knowledge was power… quite clearly, it is in fact energy. I even respected some of the baddies (Decepticons) in this franchise, although Star Scream’s voice still pisses me off to this day. The sassy robotic maid that many youngsters grew up on, dreaming of the day when they’d have their own animatronic hired help. 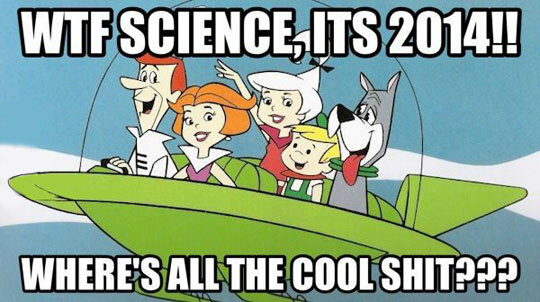 That future is still ways away and you could probably blame The Jetsons for giving false hope to an entire generation. I feel Rosie screwed up too much to keep her job, so she must have had something incriminating on George, the man of the house. Either that, or they were boinking behind Jane’s back! While WALL-E (an acronym for Waste Allocation Load Lifter – Earth-Class) is only capable of saying his own name, it’s very easy to fall in love with the little android, as he searches for fellow automaton EVE, who he has fallen in love with. Due to the popularity of the character and movie, real WALL-E robots have been designed and manufactured, including one which can be seen roving the Disneyland theme park. There’s an autograph I’d love to have! This loveable piece of machinery went from a section of the manufacturing assembly line to becoming a sentient being, who loves to learn and needs to consume constant stimuli. While I agree with his stance on TV, movies, and even music, his enjoyment of books is something I don’t share. Still, I hold no ill-will towards the robot. Johnny 5 even out-acted Steve Guttenberg, which is no small feat. This chain-smoking, drink-guzzling hunk of metal uses his gruff exterior to hide… well, an even gruffer inside, really. Bender is always looking for a get-rich-quick scheme and will stop at nothing to achieve his debaucherous desires. Throughout the Planet Express adventures, we also met androids like Santa Claus (an evil gift-giver, of course), the robot devil, Calculon, Kwanzaa-Bot, Flexo, and the Epsilon Rho Rho fraternity. Some honourable mentions should be handed out to the likes of Kevin, Screech’s robot servant on Saved by the Bell, as well as the Fembots from Austin Powers… I’d let those ladies do whatever they wanted with me! While neither the T-800, T-1000, or Terminatrix (she could tie me down anyday!) managed to make this list’s cut, I did find a way to include the robot as today’s shot of choice. For garnish, I even found a Gummy Eye Candy from Halloween that worked with the theme of robots. I added a little Jagermeister Spice to the recipe to liven things up and the whole concoction was so good, I made it twice! How great would it be to instantly zap yourself from work to home, avoiding a tiresome and frustrating commute? 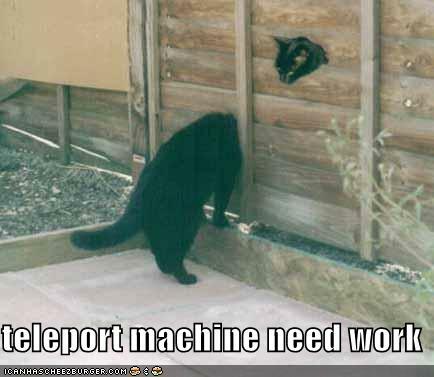 How about being able to travel around the world in a flash… and not have to be a mutant to do so? Hell, even Urkel had one of these bad boys! I think the best use of a teleporter would be to pop in and out of people’s room, Monsters Inc.-style and scare the bejesus out of unsuspecting folk. Paranormal Sip Activity, yo! Let me set this up for you with a scenario we’ve all had loom before us in our future. Your significant other wants you to attend some show you have absolutely no interest in. And hey, this door swings both ways. While I’ve been dragged to plays and musicals before, I’ve also done the dragging, taking Mrs. Sip to the odd wrestling show or football game. The solution? Freeze yourself right through to the day following the event you need to avoid and voila, you’re safe and sound! Ranging from hovercrafts to light speed travel pods, I can’t wait for the days when traffic not only doesn’t limit me, but can no longer get me killed. I’d like to think of myself as a good driver, but there are so many bad ones out there. How nice would it be to leave out all the guesswork and even the playing field. Or, better yet, be able to take to the skies and zoom past the horrible motorists… although air transportation would surely provide its own slate of concerns. I wouldn’t say that I’m a violent person, but put one of these babies in my hands and goodbye homeless population! What’s that? You want my hard earned money so you can waste it on booze… wait, I’m all for that noble cause and that is where the cash is going anyway… where was I, oh right, ZAP! Goodbye panhandler, my money is mine to waste on jelly beans and race horses. Providing they don’t rise up and try to take over the world, having robots at our beck and call to do every single daunting task we don’t want to do would be amazing. We’re getting there, what with our Roomba vacuums and assembly lines. Best of all, you could have your pick of famous robots from Rosie of The Jetson’s fame to Bender Rodriguez from Futurama. I’d probably settle on Short Circuit’s Johnny-5 thanks to his mix of heart, intelligence, humour, and love of Steve Guttenberg. Which science fiction creations would you love to see in the real world? How would you best use them to your advantage? What do you hope never sees the light of day? I eagerly await your thought-provoking responses! I adapted the cocktail version of this recipe to turn it into a shooter. Despite the wide array of ingredients, I liked this shot. 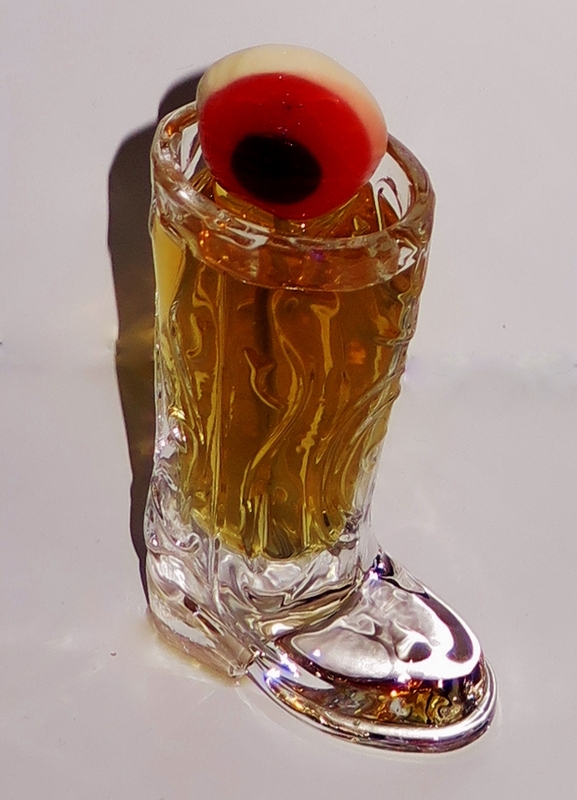 You never know how the licorice-flavoured spirits will behave when combined with other ingredients, but in this case, I feel the Ouzo enhanced the shot, rather than making it suffer as a result of its inclusion. 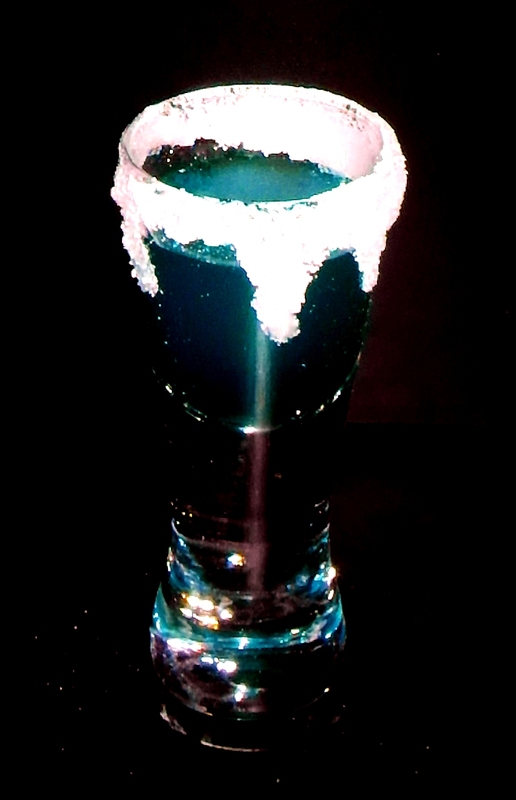 The Sugar Rim, which I created with candy powder was also a nice sour bonus to go along with the sweet liquid.